#1 – I finally found something that makes me WANT to carry my Nikon dSLR around with me! As you can probably tell by from some of my posts on this blog, I love to take photos. Traveling with a good camera is always a struggle. Do you carry a camera bag? And advertise that you’re a tourist/carrying expensive equipment with you? I’ve bought two bags, one from Epiphanie and one from Kelly Moore, that look like purses but have compartments inside for camera equipment. But both of them wind up feeling very heavy and bulky. On my last trip, I literally wound up stashing my Nikon in a fabric tote bag and just carrying it around in that, despite the lack of protection. It’s not large enough to carry an extra lens, and it’s not large enough for when I use my zoom lens, but for just carrying my camera around with my prime lens, which is what I use most these days anyway, it’s perfect. If I pare down, I can even carry everything I need in it, sticking little things in the front pocket. And it looks good, too. #2 – As part of working on my français, I’ve been watching a lot of French films. Combine that with a hearty endorsement from Entertainment Weekly, and Starbuck went to the top of my Netflix DVD queue. #3 – I think the best part of being told that I spent enough money at Sephora over the past year to qualify for Sephora VIB Rouge is the exclusive shade of Bite Beauty lipstick that came with my welcome kit. My love for Bite has already been partially documented, but I’ve been waiting for summer to be over to break this beauty out. It is THE perfect Fall red. It’s a tiny bit darker, a tiny bit deeper than a bright, true red. Very, very vintage feeling. So much so, in fact, maybe somewhat inspired by all the World War I and II historical fiction I’ve read lately, that the other night, I did my hair up in pseudo Victory Rolls, put on some black eyeliner and a vintage choker I bought at a flea market, and painted my lips with this red. And I looked like I stepped out of another era. Which is how I like it. #4 – I had let my subscription to Birchbox lapse when they sent out samples of Joie’s then brand new signature scent, Folle de Joie. But reading the blog and following them on Twitter, I kept seeing them talk about how amazing the scent was. I’m a bit of a perfume collector (more on that a different time), and every blogger who had tried it seemed to adore it. I’m a bit finicky with scents, having a very sensitive nose and stomach, so I sometimes can’t wear scents that are popular with other people (for example, Flowerbomb). I decided to go into a Joie store when I was in the neighborhood and try it on for myself. Besides for needing to try it on first, another perfume is the last thing I should be spending my money on right now. People describe it as very summery scent, but I don’t see it that way. It feels to me like an all-year scent. It just seems to fit me. #5 – Sorry, I know I’m laying it on thick with the French in this post, but I try to absorb it however I can, and this includes listening to French music. I have a friend who knows more about music than I ever have, and she keeps introducing me to bands, especially French bands. Amusingly, most of these French bands sing in English. But she recommended I buy Lescop’s album, and I’m glad I did. But it’s on especially heavy rotation right now, because it’s moody, atmospheric, perfectly French, and perfect for Autumn. Listening to this album is the aural equivalent of wrapping up in a cozy sweater with a cup of tea. It just evokes the season to me, and I’m welcoming it with open arms. Who really cares how I discovered them? The discovery has pretty much changed my life. I have listened to The Midnight Organ Fight so many times, I’ve lost count. There have been times I’ve listened to my favorite song from that album on repeat for weeks at a time. And that was their second album, the follow-up to Sing the Greys. Since then, they’ve released The Winter of Mixed Drinks, State Hospital EP, Pedestrian Verse, and, most recently, Late March, Death March EP. Sadly, as I mentioned, they have since stopped playing my favorite song live, as well as many of their earlier, well-loved, songs. So I will leave you with the first single from Pedestrian Verse, because it’s fantastic AND you are likely to hear this one live, should you catch them. They are on tour, and I would highly advise you to check them out for yourself. Let me know what you think! Today’s object of desire is by a jeweler that I have been a bit obsessed with of late, Stephie Tchamanian , whose line is called Liliclaspe. I’ve bought about 20 pieces from her in half a year, and people ALWAYS comment on it. She has style. She is a doll. And her jewelry is to die for. However, again, unemployed, no money, yadda yadda. Also, this one is a bit more pricey than the other pieces I have bought. But I am obsessed with the colors of the stone. A friend recently commented to me, “You’ve really been into raw stones lately,” and she’s right. I’ve gotten a lot of druzy and rough-cut stone pieces from Liliclaspe (as well as Cleopatra’s Bling, seen here), and this would just put the feather in my cap of a collection. Maybe it’ll still be there when I can afford it! If not, I’m just enjoying looking at it. If you head over there, send my regards! Everyone dreads Monday, and I’m no exception. Even while unemployed, it still doesn’t sit well. I’ve found that music is a good way to get through it, so I thought I would start doing Music Monday. This song just gets to me. The words. The melody. The harmonies. To me, it’s a small piece of musical perfection. I hope you like it as much as I do! On another note, I had the most fantastic New York Sunday. I hope to write about it soon. How were your weekends? 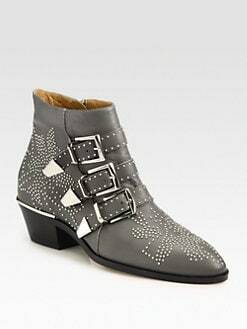 Just around a year ago, I first saw a photo of one of the WAGs* from my team wearing these AMAZING boots. She had them in black. And in red. And I wanted to know who made them. And to own a pair myself. I held out some hope of them being even remotely affordable. I mean, why crush my dreams before they even began? Well, I should have known. They turned out to be the ubiquitous Chloé Susanna (née Susan) boots. Ou comme ca? Or these ones? Le sigh. OF COURSE they would have to be ridiculously unaffordable designer shoes. These puppies would set me back $1345 dollars. To anyone who a) is on a budget b) likes to travel a lot c) is not rich and famous and d) has any brains in their head, that’s just too much money to spend on A SINGLE PAIR of shoes. Granted, a spectacular one. And, at the time (like now), I was unemployed. Definitely no time to spend that much money. But, as I mentioned, if you’re someone who loves to travel, how do you reconcile spending the amount of money of a plane ticket to Europe on a pair of shoes EVER?? Go to Paris or buy the Chloé boots? I mean, really?! The scary thing is, if you google them, SO many people have them. Which is the trouble with coveted, iconic designer items. And one reason why I usually stay away from buying things that are very recognizable—I don’t really like to have the same things as everyone else. But I really can’t blame all these regular people who have spent the money on them—they just look so damn good on! So I contented myself with these very serviceable knock-offs by Vince Camuto. But I confess, every time someone has complimented me on them, and it’s been very often, I invariably reply with, “Thanks, they’re my fake Chloés.” Which shows where my heart really lies. A couple of months ago, a used pair of the red boots showed up on eBay for half price, and the only thing that kept me from snatching them up was that I am once again unemployed. And the last vestiges of sanity that told me that over $700 for a pair of boots is STILL too much. Le sigh encore. Just recently, I saw a photo of one of my favorite French bloggers, Valentine, wearing the Susanna boots, and my lust was reawakened all over again. So the question becomes: When I am once again employed, what do I do? Do I buy them? And which color?? And how does one find a sugar daddy?? But whether or not I do, these divine beings remain at the tippy tippy top of my wishlist.